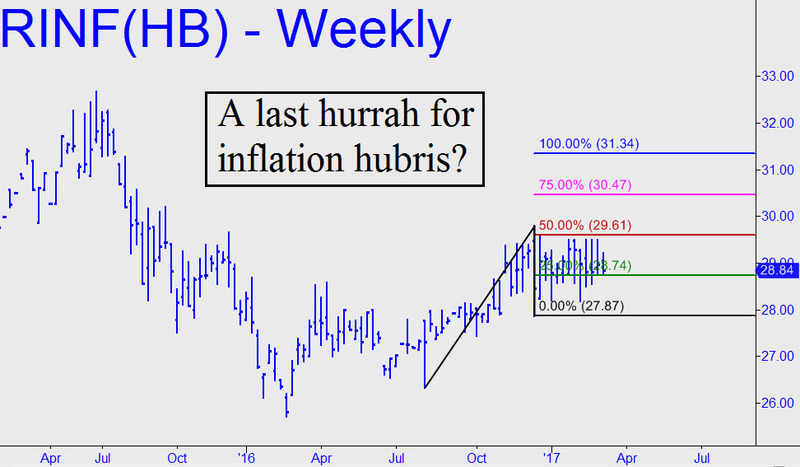 The Last Hurrah For Inflation Hubris? RINF is the symbol for an ETF trading vehicle that tracks inflation expectations. This is of more than passing interest to me, since I’ve been a hard-core deflationist and written on the topic for more than 30 years. RINF has yet to break out on a long-term basis (see chart above), and I am extremely skeptical that it will. Incipiently deflationary forces arising from debt, and from the substitution of machines for workers, are vastly more powerful than any catalyst one could imagine for inflation. As such, those hitherto intractable engines of inflation — government, healthcare and college tuition — have hit a wall. Quite clearly, none of us can afford to pay more for those things than we are already paying. A surge in wages seems most unlikely to alter the equation. Meanwhile, private pensions and the Social Security system are headed toward certain bankruptcy. This is one problem that cannot be monetized by having the Fed purchase Treasury debt, since it involves actual cash dollars that would get spent by recipients each month on real goods and services. Someone would have to pay for those things, and that someone would have to be working stiffs who, perforce, would be taxed to death. Nothing could be more deflationary than a collapsing pension system. Unfortunately for us all, it is inevitable. The only reason we are not as worried about it as we should be is that the financial psychopaths at the Fed have pumped up the stock market to assuage our fears. To complete the delusion, our actuaries are hard at work factoring pension returns for the next 50 years as though the bull market in stocks will continue forever. It won’t, of course, and when it finally ends — which it will — the epiphany of our bankruptcy will come literally overnight. Concerning RINF’s chart, it is inconclusive on the matter of whether an inflationary spiral awaits. I have given my reasons why I think this is nearly impossible. However, a dead-cat bounce to the 31.34 target is not beyond the realm of possibility. If it happens, I would expect it to be the last hurrah for both inflation and Fed hubris. It might even prove to be a precise marker for the onset of a deflationary debt collapse that long ago became unavoidable.